After a relatively weak recovery from the recent recession, the rate of improvement in the economy of the Potomac Highlands region is expected to increase in coming years. Employment and income per capita are expected to grow at a rate that is at least on par with that of the state as a whole in coming years, while every major industry is expected to add jobs. 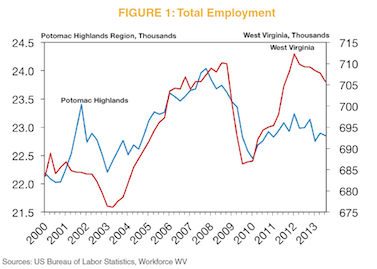 Employment growth in the Potomac Highlands has been sluggish since the recent recession. The region lost jobs at a rate that exceeded the statewide average during the recession, and has added back only around one-fourth of the jobs lost. Manufacturing’s share of employment in the Potomac Highlands is triple the statewide average. Employment in the sector fell substantially during the recent recession, but has recently begun to improve. 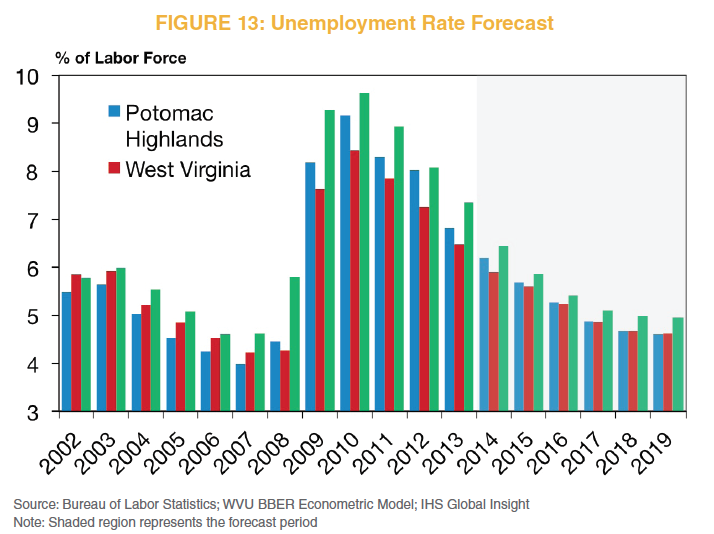 The unemployment rate in the Potomac Highlands has fallen substantially after the recent recession but still stands about two percentage points above its pre-recession level. Unemployment in the region is slightly higher than the overall West Virginia average, but is lower than the national figure. Per capita personal income has grown at a healthy pace recently, averaging 3.5 percent per year since 2008. This rate of growth has exceeded that of the state as a whole, and is far ahead of national rate over the same period (1.7 percent per year). Population in the Potomac Highlands has declined in recent years, losing approximately 1,500 residents since 2010. The area’s population is older and posts a lower level of educational attainment than the state as a whole. 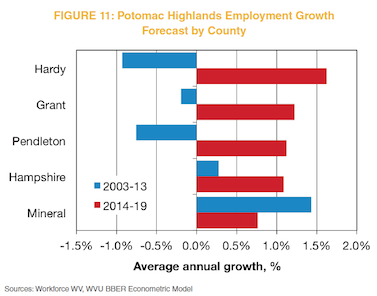 We expect employment to grow by 1.2 percent per year in the Potomac Highlands over the next five years. This rate will exceed that of the state, where growth is expected to be 1.0 percent annually over the next five years, but it will fall short of the nation, where expected growth is 1.5 percent annually. The construction sector is expected to produce the fastest rate of job growth in the coming years, with a forecast of 5.6 percent rate of annual job growth. Professional and business services, education and health services, and information are also expected to expand at above average rates in coming years. All major sectors are expected to add jobs over the next five years. Unemployment is expected to continue to fall over the next five years, and will likely converge with the state rate. This improvement in unemployment will be accompanied by re-entry into the labor force in the medium-term. Per capita personal income is expected to increase at an annual average rate of 2.1 percent over the next five years. This rate of growth will be on par with that for West Virginia as a whole (2.0 percent) but below that of the nation (2.7 percent). 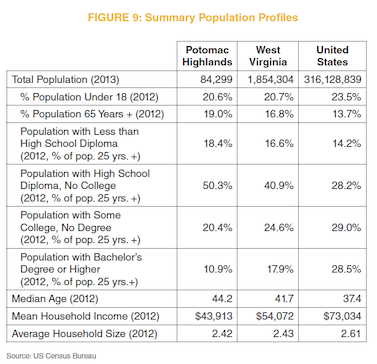 Population in the Potomac Highlands is expected to be steady in coming years. Births are expected to fall short of deaths in coming years given fundamental underlying demographic trends; any growth in population will depend on net in-migration. 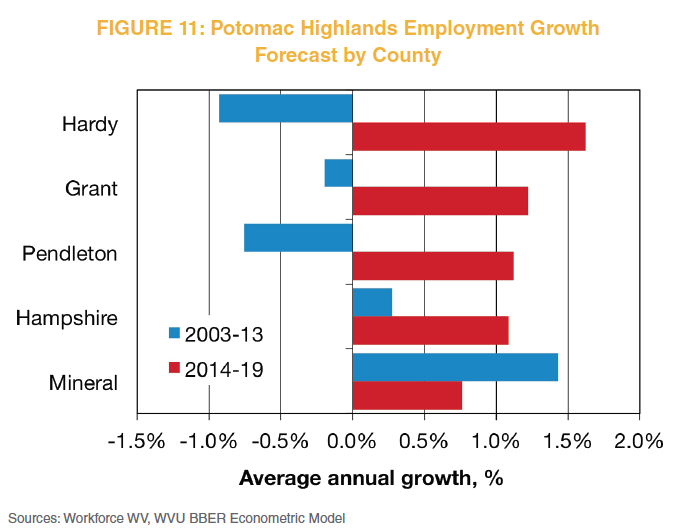 The West Virginia Potomac Highlands Region1 experienced a significant decline in economic activity during the Great Recession. Between the final three months of 2007 and the first quarter of 2010, total employment in the five-county area fell 6.6 percent, or a cumulative decline of nearly 1,600 jobs. By comparison, the rest of the state experienced a milder recession as employment declined by 3.3 percent. 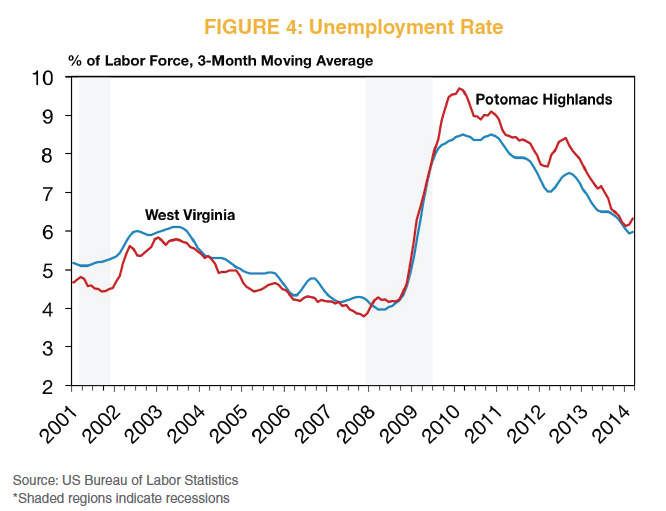 The rate of job losses in the Potomac Highlands Region’s slightly exceeded the national average (-6.2%) during the economic downturn.2 Thus far, the region’s labor market recovery has been tepid as employers have only added roughly one-fourth of the jobs that were lost during the recession. In terms of the five counties that comprise the Potomac Highlands Region, Mineral and Hardy counties are the largest, containing approximately 60 percent of jobs in the area. However, economic trends in these counties have been quite different over the course of the past several years. Hardy County experienced the region’s largest percentage decline in employment during the recession, as payrolls fell 16 percent from their pre-recession peak. The county’s recovery has been weak for the past few years, but payrolls have begun to trend higher in the past year. By comparison, Mineral County experienced a much milder downturn, as payrolls remained mostly unchanged for more than four years. Hampshire County saw local payroll levels drop 6.7 percent during the recession, but unlike the other counties in the region it has also experienced a fairly healthy recovery in recent years. One likely explanation for the county’s bounce back is due to its connection to the Winchester VA-WV metro area. Approximately 47 percent of Hampshire County’s residents who hold a job commute to another state for work and most of those workers drive into the independent city of Winchester and Frederick County, Virginia. The city of Winchester’s economy has remained sluggish but Frederick County, VA has enjoyed robust growth over the past two years, notching an estimated 7 percent increase in employment during 2013. 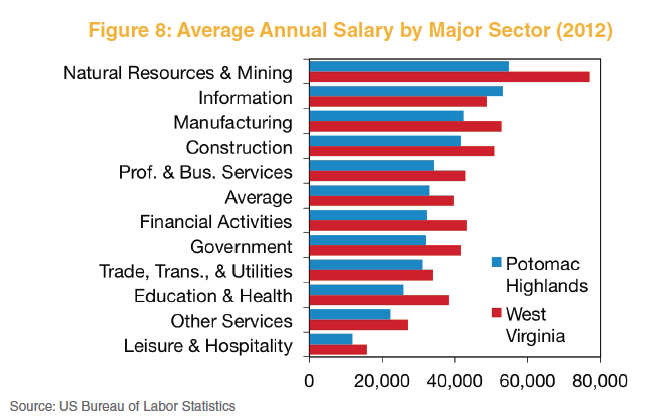 Although the public sector accounts for the largest share of employment in the Potomac Highlands region, just as it does for the state as a whole, the region’s industrial composition is measurably different from other parts of West Virginia. The manufacturing sector contains 21 percent of all payrolls in the Potomac Highlands, more than three times the share in the rest of the state, with most of the jobs concentrated in food processing (poultry), defense aerospace and lumber and wood products. The manufacturing sector also accounted for more than 60 percent of the jobs lost in the region during the recession. For example, the steep nationwide contraction in new housing construction had a significant negative impact on wood and furniture producers operating in the region while shifting federal defense spending priorities hurt the local aerospace industry. On a positive note, employment in the sector as a whole has begun to turn moderately higher in the past year, largely reflecting a nascent rebound in new housing demand across much of the nation. Reflecting the same trends occurring at the state and national level, payroll levels in the education and health services sector in the Potomac Highlands have expanded at a solid pace over the past few years. Mineral County healthcare providers have seen the steadiest gains in employment since the beginning of 2010, but the addition of the new $26 million Hampshire Memorial Hospital facility has also benefited the sector locally. 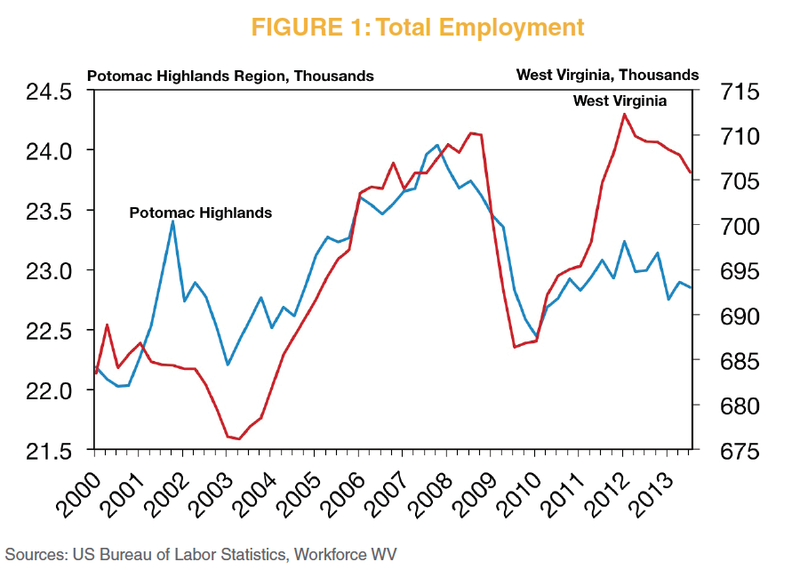 While the region’s trucking and warehousing industries have experienced a modest jump in activity since the end of the Great Recession, the Potomac Highlands’ consumer-based sectors, namely retail trade and leisure and hospitality, have struggled to gain traction as several of the region’s linchpin industries have remained stable or posted only modest increases in employment in the past year. The region’s construction sector has experienced little sustained job growth since the end of the recession. According to data from McGraw-Hill, the total number of new homes started in the past 12 months in the five-county region remains nearly 77 percent below the peak level observed at the height of the housing boom. Spending on nonbuilding projects has fallen considerably over the past two years, reflecting the completion of a couple of wind power projects and the broader decline in public spending on infrastructure. The overall level of nonresidential construction activity is beginning to improve, however, thanks in part to the construction of the new Franklin Elementary School ($12.6 million) and the $43 million renovation and expansion projects for Moorefield High School and East Hardy High School in Hardy County. 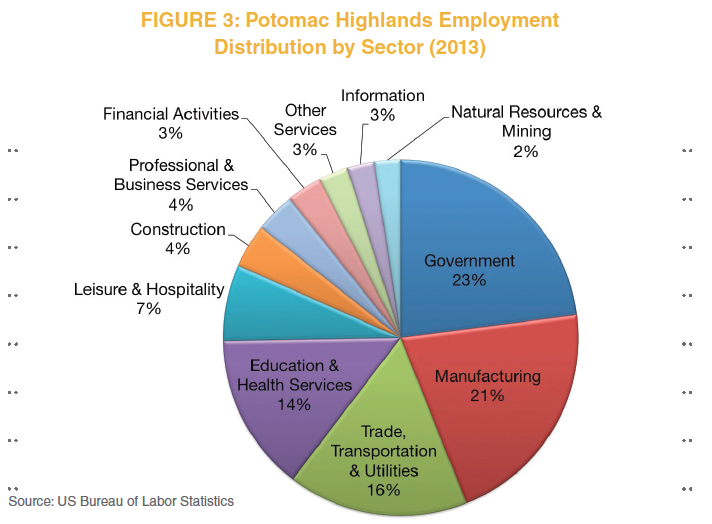 One important portion of the Potomac Highlands economy that is not fully represented in the figures presented above is its farm sector. Some agricultural workers are captured within the natural resources and mining sector, but the majority of the jobs reflected in this category come from Grant County’s coal mining industry. Data from the US Bureau of Economic Analysis show that more than 2,600 people were employed at farms in the Potomac Highlands region during 2012, or 7.2 percent of total employment. This is more than three times the statewide share and nearly five times larger than the national share. 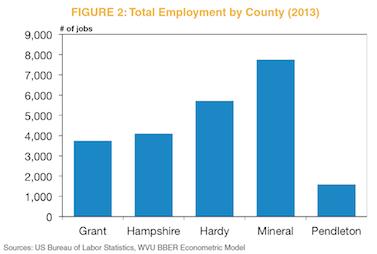 Among the counties in the region, Pendleton County contained the highest share of farm employment (16.6 percent) while Mineral County contained the lowest share (4.0 percent). The 2012 Census of Agriculture indicated that the fivecounty region contained over 2,700 farm operations, and totaled more than $400 million in direct sales of agricultural products. Broilers and layers represent the single-largest source of farm activity in the area, particularly in Hardy County, which accounted for approximately 40 percent of all broilers sold and a similar share of layer inventory. 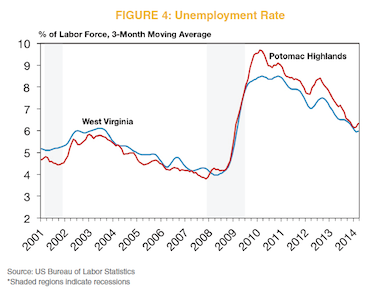 After falling to just below 4 percent before the onset of the Great Recession, the deteriorating labor market in the Potomac Highlands and the surrounding region caused the jobless rate to rise rapidly, reaching a peak of 9.7 percent by the first quarter of 2010. This exceeded the peak observed for the rest of the state by nearly 1.5 percentage points, but still remained slightly what was measured nationally. Since that point, however, the region’s unemployment rate has trended mostly lower and finished the first quarter of 2014 with an average of 6.2 percent, just above the state average of 6 percent. 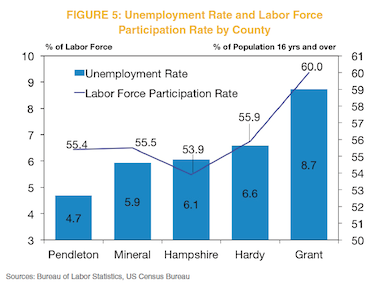 Among the individual counties in the region, Grant County saw its unemployment rate peak at 12.1 percent at the height of the recession, while Hardy and Hampshire counties both surpassed 10 percent in late 2009 and early 2010. The unemployment rate has fallen appreciably for all five counties, but as of the first quarter of 2014, Grant County’s unemployment rate remains the highest in the region at 8.7 percent while Pendleton County’s is the lowest at 4.7 percent, down from a peak of 9.2 percent during the first quarter of 2010. The downward trend in the unemployment rate is positive news and strong economic growth in neighboring portions of Virginia does point to an improvement in the broader regional labor market. Some of this drop in the unemployment rate can be attributed to a decline in the number of people participating in the labor force during the past few years. All five counties saw the size of their labor forces shrink at least slightly since the beginning of 2010. Even with these declines, however, labor force participation rates in the Potomac Highlands generally exceed that of the rest of the state, where less than 54 percent of the 16 years and older population was in the labor force. 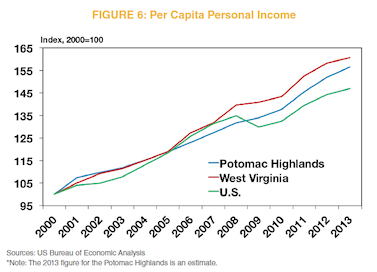 Per capita personal income for the Potomac Highlands Region was estimated at approximately $31,500 during calendar year 2013, without adjusting for inflation, which marked a 3 percent rate of growth over the previous year. For the state as a whole, per capita personal income came in at just above $35,600 during 2013, increasing 1.5 percent from the previous year. 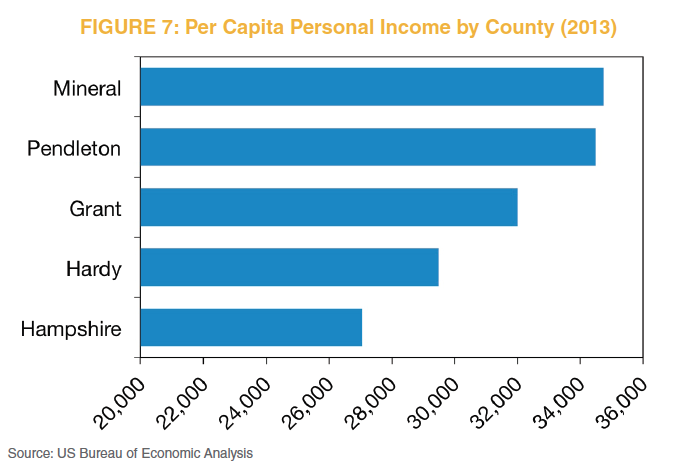 In addition, the five-county region enjoyed gains of nominal per capita income over the duration of the economic downturn, averaging an increase of 3.5 percent per year since 2008. This rate of income growth exceeded that of the rest of the state (2.8 percent) and is more than double the rate of growth that was observed nationally (1.7 percent per year). Mineral County residents have the highest per capita income levels of the five counties that make up the metro area at an estimated level of more than $34,700 in 2013. The county’s industrial mix, namely the presence of Alliant Techsystems, WVU-Potomac State and IBM, helps to support income levels in the area. While all counties in the region tend to lag the statewide average in terms of overall wage and per capita income levels, growth over the past five years has been above average in every county except for Grant, which still recorded a 2.4 percent average annual increase in per capita income since 2008. Local income growth has also been supported by the large share of local residents who commute into relatively stronger labor markets in Virginia and Maryland for work. Until recently, the Potomac Highlands had experienced fairly robust population growth. Between 1990 and 2010, the region saw the total number of residents increase by more than 13,000. Over the past three years, however, the region’s population has lost approximately 1,500 residents, as all five counties saw the number of residents decline since 2010. 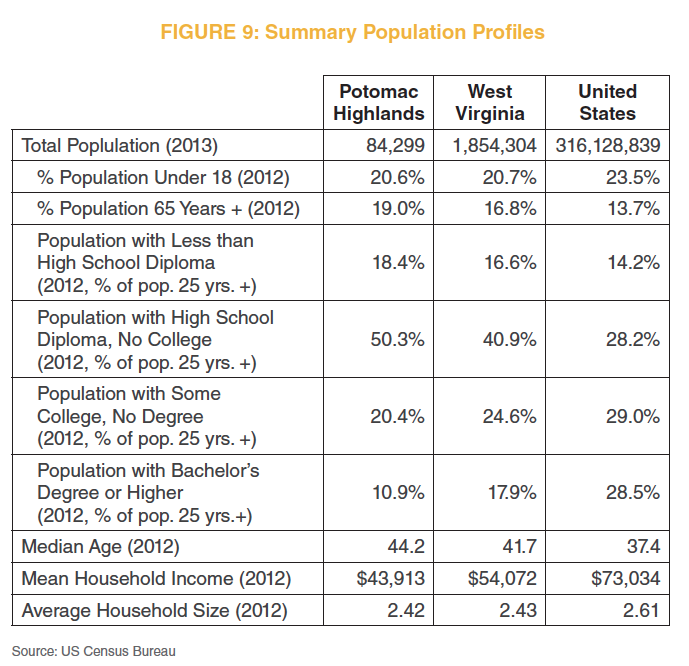 The underlying demographic trends of the Potomac Highlands Region are similar to that of the rest of West Virginia but there are notable differences that are worth mentioning. Just like the state as a whole, the region experienced an upturn in net migration during the 2000s that has since reversed course and turned negative over the past three years. While the region has roughly the same under 18 population share compared to the state, the region has a larger population share in the over age 65 category compared to state and national norms, with 19 percent of residents over the age of 65. The median age in the region is estimated at 44.2 years, compared to 41.7 for the state. Finally, educational attainment levels also tend to be lower in the Potomac Highlands Region as slightly less than 11 percent of residents aged 25 and older possess at least a bachelor’s degree. 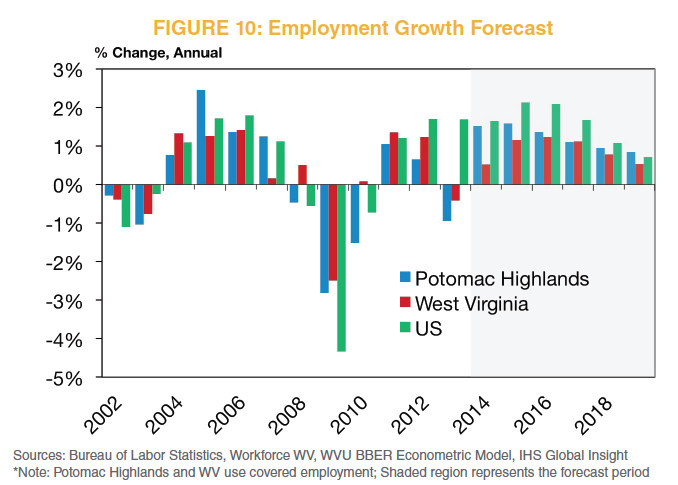 Expectations for the US economy during the forecast horizon will have a significant impact on the Potomac Highlands region going forward.3 Our forecast calls for the economic recovery to continue over the next five years. 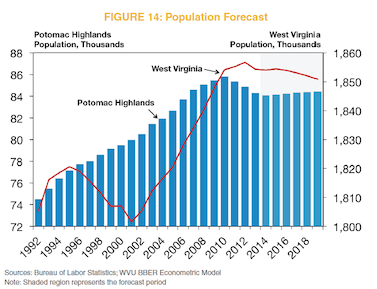 Projected economic growth at the state and national level during the outlook period bodes well for the Potomac Highlands and should allow the local economy to enjoy growth that is slightly above the state average (1.0 percent) through the end of 2019. We anticipate total employment will increase at a rate of 1.2 percent per year. 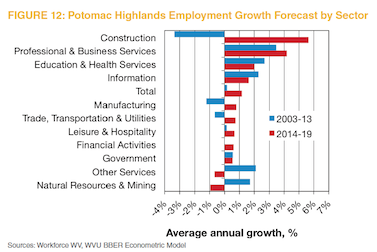 Although this represents a markedly stronger rate of job growth for the region compared to the past 10 years, we anticipate the Potomac Highlands region’s outlook will be driven to a great extent by steady job growth in the healthcare and business services sectors, a rebound in local manufacturing and construction activity as well as continued strong growth in nearby employment centers outside of the state. We anticipate Hardy County will experience the fastest rate of job growth during the forecast period as its manufacturing sector continues to rebound from a deep recession and builds upon the recent gains of the past year. Grant County’s economy is expected to see a fairly broad-based recovery going forward, with employment gains averaging approximately 1.2 percent over the next five years. This expectation could change if proposed clean-air rules affect both the demand for coal mined in the area as well as the operations at Dominion’s Mt. Storm power plant. At the same time, a healthier pace of construction in the region’s nonresidential and nonbuilding market segments does provide upside potential for Grant County. Pendleton will see a rate of job growth of 1.1 percent over the period. Hampshire and Mineral counties will trail the region’s average rate of growth during the outlook period, as these areas either endured relatively mild recessions or are already in the midst of a solid recovery. Of the major sectors in the Potomac Highlands region, our forecast calls for construction to post the largest percentage increase in employment, expanding at a rate of 5.6 percent per year between 2014 and 2019. We anticipate growth in local construction employment will come from a variety of sources, including the ongoing school construction and renovation projects in Pendleton and Hardy counties. Construction of new single-family homes should rebound as well since the low pace of new homebuilding activity that has occurred over the last five years is significantly lower than normal levels. The professional and business services sector is expected to grow at a healthy pace over the next five years, mostly reflecting a firming national economic recovery that should boost demand for the business and administrative support businesses that operate locally. Our forecast calls for education and health services to register job gains of two percent per year through the end of 2019. While widespread national concern over the cost of healthcare services do pose a risk to the forecast, the Potomac Highlands region’s underlying demographics, namely its old and aging population, should support growth in a wide range of health care services. Manufacturing jobs in the Potomac Highlands region are expected to grow at a rate of 0.8 percent per year during the outlook period. Most of these gains will likely occur within the region’s lumber, wood and furniture products industries, as the ongoing rebound in new home construction and continued strong pace of remodeling activity across much of the nation bolsters demand for local products. While additional cuts or shifts in federal defense spending are possible during the forecast period, particularly given the debate over federal fiscal conditions, we expect the region’s aerospace manufacturing industry to avoid any more significant losses and at least remain stable going forward. Finally, while some short-term gains in jobs are possible, payroll levels within the food (poultry) processing industry will trend slightly lower over the forecast horizon, continuing the trend of the past 20 years. The region’s consumer-based sectors, leisure and hospitality and the retail portion of trade, transportation and utilities, are expected to see moderate growth of 0.7 and 0.4 percent, respectively, during the outlook period. Solid income growth over the next five years should lift consumer spending activity in the area and offset the impact of an older and generally stable level of population. Public sector employment is expected to grow at an average annual rate of 0.5 percent per year between 2014 and 2019, mirroring the rate of growth that was observed over the past decade. Most of this growth over the forecast horizon will likely stem from hiring at the state and local level of government, whereas the region’s federal employment will decline moderately in line with broader state- and nationwide trends. Natural resources and mining is one of two sectors in which the forecast calls for a decline in jobs. Although much of this is driven by the continuing downward trend in the region’s farm sector and associated industries, the limited amount of coal mining and mining support indus-tries operating in the Potomac Highlands will be under pressure throughout the forecast horizon. Abundant natural gas reserves in the Marcellus and Utica Shale plays pose significant competition in the power market, as will the increased deployment of renewable energy resources. However, regulatory impacts are the primary source of downside potential as a recently-upheld rule for cross-state emissions from coal-fired utilities could significantly hurt the demand for coal mined in the region. The region’s recovery should spark a continued decline in the unemployment rate during the 2014-2019 outlook period. For calendar year 2014, we expect the jobless rate will average 6.2 percent in the five-county area, somewhat higher than the statewide average but still below the national rate. 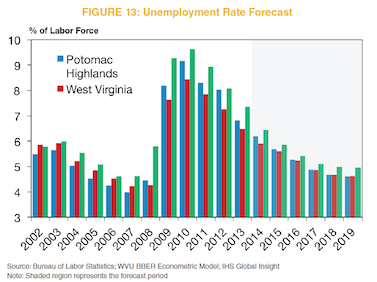 By the close of the forecast horizon, we expect the unemployment rate in the Potomac Highlands will fall to 4.6 percent. In line with general historical trends, Grant County will likely have the highest unemployment rate during the outlook period. Pendleton County is expected to have the lowest rate in the region, though it will not move much lower from its current level of 4.7 percent. With the job market set to improve within the region and for solid expectations for growth in areas where local residents drive to work, the forecast calls for a moderate increase in the size of the labor force during the first half of the forecast horizon. By the latter half of the forecast horizon, however, as the region’s population continues to age in place and retire, the Potomac Highlands Region’s labor force will slow considerably and could begin to fall off if net migration flows into the area do not improve as anticipated. 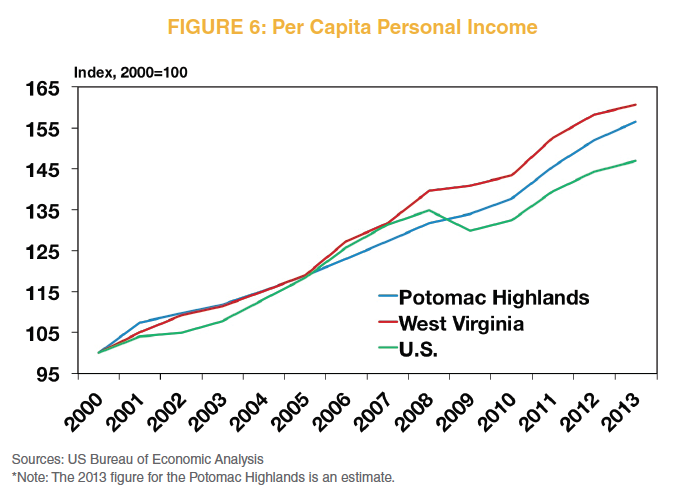 Inflation-adjusted per capita income growth in the Potomac Highlands is projected to increase at an average annual rate of 2.1 percent through 2019. This will beat the statewide average of 2.0 percent by a slight margin, but still trail well behind the 2.7 percent per year rate of growth expected for the nation as a whole. Strong job growth in a few of the region’s relatively high-wage sectors should bolster real wages and salaries earned by workers employed in these industries while at the same time rising equity markets and interest rates should bolster local households’ income earned from investment plans and interest-bearing accounts. Finally, since the forecast assumes no significant changes to Social Security and Medicare, transfer payments will continue to rise during the outlook period and pick up slightly in the latter of the forecast horizon as a growing share of people in the region reach retirement age. After observing population decline in each of the previous three years, with an additional decline expected in 2014, the forecast calls for the Potomac Highlands region’s resident population to increase slightly over the remainder of the outlook period. Any growth in the region’s population will hinge directly upon an improvement in net migration swinging back into positive territory as the contribution from natural changes in the population (births minus deaths) will remain decidedly negative. Hardy and Hampshire counties are expected to account for all of the projected population growth in the region, offsetting very small declines that are anticipated for the region’s other three counties. is the sum of gross value added by all resident producers in the economy plus any product taxes and minus any subsidies not included in the value of the products; calculated without making deductions for depreciation of fabricated assets or for depletion and degradation of natural resources. Gross product can be calculated for various sized economies. This paper references Gross Product for counties (GCP), MSAs (GMP),states (GSP), and the domestic economy as a whole (GDP). is the sum of the incomes of an area’s residents; it is calculated as the sum of wages and salaries, proprietor’s income with inventory valuation and capital consumption adjustments, rental income of persons with capital consumption adjustments, personal dividend income, personal interest income, and personal current transfer receipts less contributions for government social insurance. is the mean personal income within an economic aggregate, such as a country or city. It is calculated by taking a measure of personal income and dividing it by the total population. Per capita personal income is often used as average income, a measure of the wealth of the population of a nation, particularly in comparison to other nations. is the number of persons whose usual place of residence was within the area at the time the census was taken. It is also referred to as resident population. Persons in the military or institutionalized are counted where the military base or institution is located. data has been adjusted for inflation. Using real data eliminates the year-to-year changes in price and gives a clearer picture of the true changes in purchasing power, production, etc. dollar amounts have been adjusted for inflation. Using real dollars eliminates the year-toyear changes in price and gives a clearer picture of the true changes in purchasing power. is the percent of the civilian labor force that is unemployed. The civilian labor force is comprised of non-institutionalized persons 16 years of age or over who are employed or unemployed. A resident is considered to be unemployed for the month if that persona is at least 16 years old and is not currently employed but is available and actively looking for work during the survey week (the week including the 12th of the month). 1. For the purposes of this report, the Potomac Highlands Region is comprised of five counties: Grant, Hampshire, Hardy, Mineral and Pendleton. 2. Sources for historical information are noted in each figure. 3. All forecast estimates presented herein are derived from the West Virginia University Bureau of Business & Economic Research Econometric Model unless otherwise noted.